Today I finally managed to do something creative. I have actually been doing lots of creative things in bits and pieces, all the time… but I finally managed to do something and finish it all in one go. It feels good. 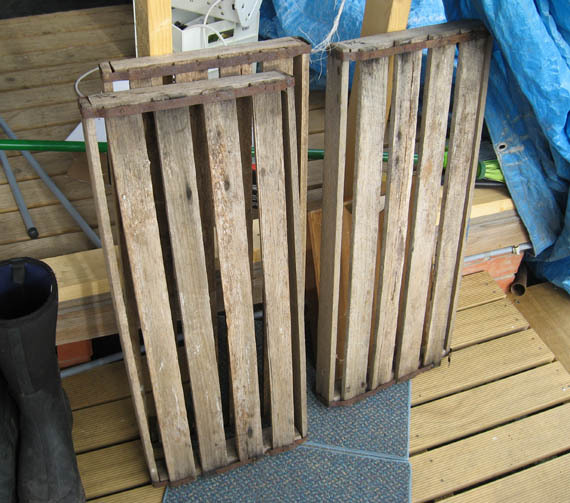 A long time ago I found these old wooden crate/trays in a tip shop. I grabbed them cause I knew I could use them. One day. Like everything else. I had plans for them, but they just took up space, got moved from here to there and then to further over for quite a few months. Over the last few months I’ve found, and collected, a couple of old shears (the ones on either side). 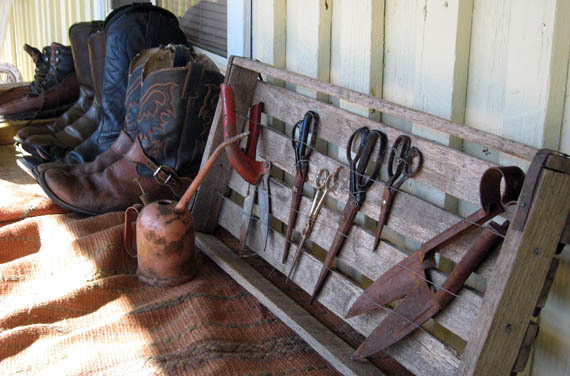 When cleaning out some of Wayne’s old horse gear I found these very old, rusty scissors. Perfect. I now knew exactly what to do with one of the crates. I drilled holes in the sides, threaded wire through to hold the shears in place. I had to use wire through the back to tie the scissors in place. I groomed a dog. I went to a garage sale and bought a ton of printing paper and two printers – one to replace Wayne’s busted one and one for a backup. And a matt cutter. And some almost antique thick cotton sheets. I bought fuel and I whippersnipped the entire yard. An observation… no matter how much care you take to pooperscoop the yard before whippersnipping, there will always be some mines for you to find, which you will hit and scatter. At least the horse pooh is bigger and easier to spot. Though I think I now know what the inside of a horse tastes like. Yeech. I’ve started a whole heap of projects. I started and finished one (above). I washed dishes. I didn’t fold the washing. I didn’t cook dinner. We went out instead. Not a bad day overall. This entry was posted in 31 days, DIY, thrifting by zefiart. Bookmark the permalink. I really like the wooden trays and how you used them. Do you know what the trays were used for? Have a wonderful, productive day. Found you on Debbiedoo's Newbie Party. Now will follow you. Timeless Treasures Come visit me. That is a really cool Idea. 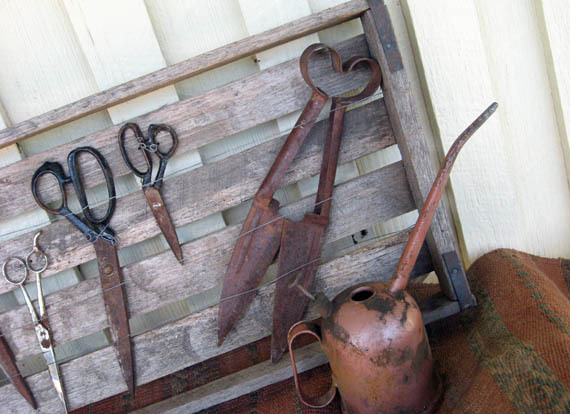 Love all those rusty scissors. Thanks for sharing at my newbie party. 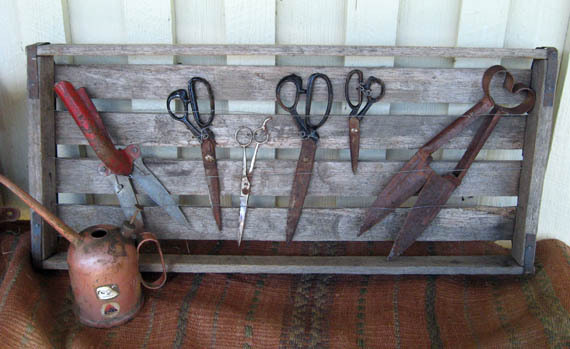 I love what you did with your collection of shears! Collections are always so much interesting when displayed together! and I especially enjoyed the description of your days activities… most of all the description of whippersnipping dog and horse poop. I can relate! Made me smile. Thanks Audrey. I think the trays were for holding fruit trays? Not sure, but cherries and raspberries are sorted into small trays then placed in larger shallow plastic trays now. Maybe these are what they used before the plastic ones? Oh, so fun to find another CollectinGal with lots of irons in the fire as well. Here in Texas we say that when we have multiple projects going as well as many WIP's…works in progress! Good use of the grates and one to spare…it will find a use in no time, too! Whippersnipping…now that's a new one for me…but I'm guessing it's similar to our trimming with a weed eater…sorta mowing without the mower! Enjoyed this post and hearing about all your days activities. Visiting from Knick of Time Tuesday! Whippersnipping isn't quite the right term. I have a big professional type brushcutter. Love that thing! LOL Whippersnippers are smaller things, I wanted the big one with the double armed hold and the harness and everything! When I use it I wear goggles, a helmet with a face shield and earmuffs, gloves and my grooming pants to keep the grass bits from sticking to my clothes and staining them. 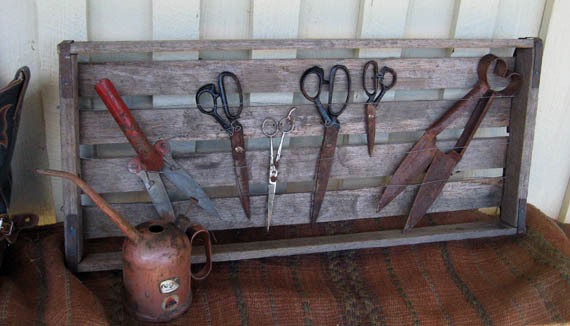 Oh I love your old shears on display. those are great box/trays.